The Town of Gawler plans and delivers a number of projects throughout each year. Key projects currently being planned and delivered by the Council include the Southern Gateway Entrance Statement, Gawler Central Urban Precinct - Stage 1, Willaston Stormwater Upgrade - Stage 1 as well as the Murray Street Upgrade - Stage 6. The Town of Gawler has recently appointed renowned Adelaide artist Greg Johns to construct his sculptural work “Land Lines” at the southern entrance of Gawler to appropriately address the historical significance, economic development, rural aesthetic and future vision of the Gawler Township. The importance of the artwork is to enrich many of the quintessential qualities of Gawler. These qualities are defined through the unique nature of topography, panoramic views and pastoral land uses that separate the town physically and culturally from the northern suburbs of Adelaide. The project includes two sculptures located on either side of Main North Road between Tiver Road and the Gawler Bypass consisting of twenty-five elements each that are made of weathering steel to reflect the colours of the Australian inland. Each individual element is positioned along a wavering landscaped mound that stretches out over one hundred metres to create a visual illusion that the sculptures move as you drive past. 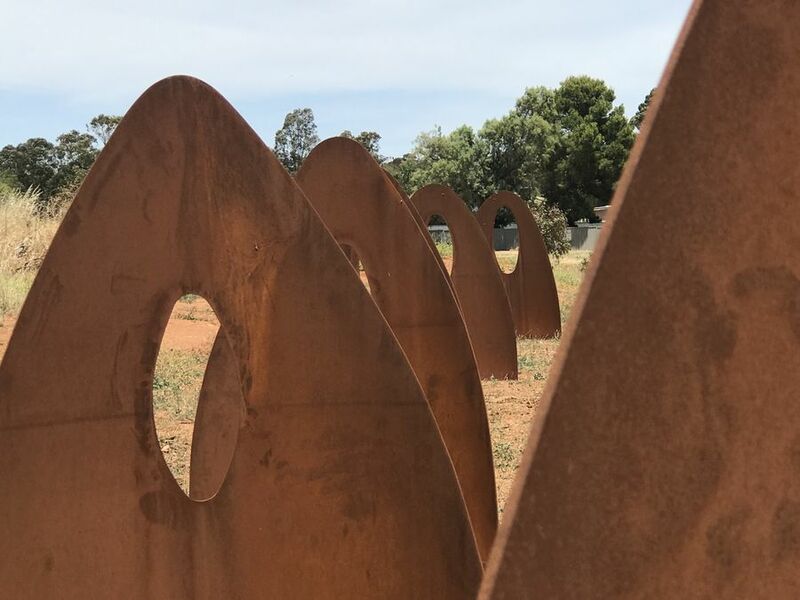 The steel components have been fabricated and installed on site and grasses native to the Gawler region have been seeded within at each of the sites. “Land Lines uses forms derived from the land, the shapes of anthill nests, and also forms reflective of agricultural use of the land, plough shapes. Both Aboriginal and European cultures are represented in the entrance statement. It is a contemporary Australian sculptural work, deliberately horizontal, reflecting our landscape”. The Gawler Town Centre Design Framework was adopted by Council in November 2016 with the objective of building upon previous strategic level investigations. The precincts were defined as Gawler North, Gawler Central and Gawler South based upon varying character, both in terms of its principal land uses, built form and potential future. This project intends to realise the vision of the Gawler Central Urban Precinct with a focus on Walker Place and the connectivity to Goose Island by creating a well design and landscaped public realm for the centre of Gawler. Currently a concept design is under development and review with the intention of commencing construction in 2018/19. The Town of Gawler are nearing completion of a $1,200,000 investment into Stage 1 of the Willaston Stormwater Upgrade. The new underground drainage system will reduce the propensity for inundation of low-lying properties during peak rain events. Drury Street, Davies Street, Bond Street and Jane Street as well as improvements to the Princess Street detention basin form the basis of Stage 1.